Store, transport, and empty consumables with Stainless Steel Food Service Bins (FSB) from BHS. 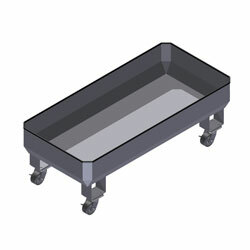 These high-capacity carts are constructed from pure stainless steel, providing safe and sanitary material handling for food processing plants, restaurants, and other food-service applications. They are durable enough for daily use to provide reliable ingredient handling shift after shift. The FDA Food Code requires all food-contact surfaces to be strong enough to avoid pitting or cracking, durable, resistant to corrosion, smooth, and safe for edible materials. Stainless steel matches all of these requirements, which is why it has become the preferred substance for constructing food-processing equipment. Stainless Steel Food Service Bins provide the added benefit of including fork pockets. In high-capacity applications, such as food processing operations, this allows staff to move bulk ingredients throughout the facility quickly. With a Forward Bin Tipper and a lift truck, employees can load the FSB at one location, efficiently transport ingredients to food production lines. There, they simply lift and empty the contents into hoppers, mixers, or other processing equipment. Custom versions of Stainless Steel Food Service Bins are also available on request. To discuss your food-handling requirement, or to find your nearest BHS dealer, call 1.800.BHS.9500.